Choosing the perfect engagement ring will be a very important decision that will require lots of planning, budgeting and time. Titanium engagement rings are increasing in popularity among many of people. Why titanium? Titanium is an extremely strong material that does not get worn down easily. It is a great choice for a ring because it does not easily lose its shape and it does not gouge. Another great characteristic of titanium is that it is light. Because of this, you do not have to worry about being weighed down by a heavy ring and you have more options when it comes to design. Titanium is an element just like platinum, gold and silver. Out of all the elements, it has the highest strength-to-weight ratio. This means that for its very light weight, it is extremely strong. Also, titanium does not react to body chemistry, sunlight or salt water. This makes it a more durable selection. If you usually have allergic reactions to jewelry, such as gold, then you will have no problem with titanium. Fortunately, titanium is hypoallergenic so it will not irritate sensitive skin. In addition to its hypoallergenic qualities, titanium is a metal that will not rust or tarnish. This is because it does not react to most chemicals. Therefore, it will not change. Titanium engagement rings come in a large range of prices. There are many options when it comes to purchasing titanium rings such as buying new, used and ones that are on sale. You can find a simple engagement ring for a couple hundred dollars or you may want a more elaborate style that could cost as much as a few thousand dollars. Titanium rings come in different styles which makes it easier to pick the perfect ring that will suit her taste. There are four popular styles of rings: tension setting, solitaire, burnish setting, and inlaid tension setting. In addition to these styles, black titanium is also available as an option. These rings are also called pressure setting rings. The stone set in this style ring looks as if it is floating in between the titanium. This is accomplished by using tension to secure the stone in the grooves of the titanium walls. Once the stone is in place, it does not move from its setting. There are a variety of jewels that can be placed in the middle of the ring such as diamonds and sapphires. This is a classic style prong setting ring. It resembles the traditional style engagement ring with a full titanium band that has a diamond attached on the top. This is a perfect option for the classic woman who wants a traditional ring with a modern titanium touch. It is strong and durable, but still has a conventional look. Burnish set titanium rings are created with a technique that inserts the stone into a space directly in the titanium band. A tool is used to push the surrounding titanium around the stone to securely keep it in place. It can also be referred to as flush setting. This style ring can range from simple to intricate designs. This is a good choice for someone who wants a modern or contemporary flare to their ring. You can also choose a ring that has one or many stones that are set into the band. This style is similar to the regular tension setting ring because of the stone that sits between the two titanium walls held together by tension. If differs slightly because now you have the option to include decorative features on the ring. You can set a design into the surface as well gold. This is a great way to enhance any ring to give it a unique style. Black titanium rings are made using Black-Ti, a titanium alloy made up of various rare materials. This option is a bit more expensive compared to the regular titanium rings because it is harder to create. One benefit of black titanium is that its surface resists scratches. But overtime, if there is extreme wear and tear on the ring, it could get scratched. This is the perfect option for someone who is edgy and fashionable. The black titanium ring has a deep, shiny black band that contrasts well when paired with a diamond. With this ring, diamonds and other stones tend to stand out more and even appear larger and brighter. Whether you start your search online or in-store, you will come to find that are a variety of options to choose from. Because they are still so unique compared to traditional style rings, many major jewelers do not carry titanium engagement rings. If you decide to search online for a ring, a great place to start is TitaniumEra.com. If you appreciate value, precision work, distinguished styles and great quality, then this is the site for you. Once you have found the perfect ring, the next step is to make sure it fits your bride to-be. To measure ring size, make sure the ring sizer fits tight and snug. This will ensure that the sizing is accurate. Another tip for ring sizing is to never try to size a ring on a cold finger. Hands must be warm because this is when fingers are at their normal size. The cold tends to make them smaller therefore creating a false fit. When trying to figure out your partners ring size without letting her know, you must be clever. Find a ring that she owns and wears on her ring finger. Use that ring as a guide to determine her ring size. You can always go online to request a free ring sizer to be mailed to your home. But it is still best recommended to go to a professional to get the most accurate sizing. Keep in mind that it is better to buy a ring that is too small than too large because there are a lot of ring styles that cannot be cut down in size. It is easier to get a ring stretched to fit the finger. Also, if you decide to order internationally, remember to incorporate all of the proper conversions necessary for an accurate fit. 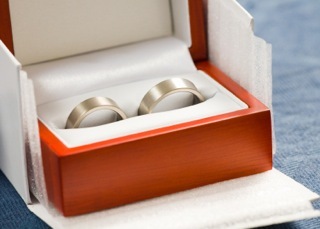 With titanium engagement rings, it is possible to get personalized engraving. Since titanium is a harder material than normal types of rings, the engraving will not be as deep as other engraving but it will last long. Laser engraving is also another great option when it comes to titanium rings. Adding an inscribed personalized message to an engagement ring is the perfect way to show your bride to-be how much you care. As you can see, titanium rings are a fun alternative to traditional style rings. They are unique and still are a relatively new concept in the engagement ring industry. More and more people are starting to buy titanium because of its long lasting, durable features and its sleek modern look.